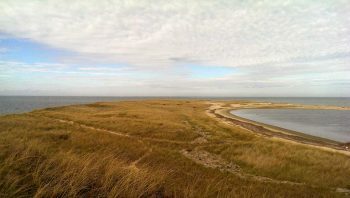 The Nantucket Land Council has been engaged in the health and protection of the island’s water since its beginnings. Through a variety of programs and partnerships the NLC continues to expand and diversify the data available to make sound policy decisions that will ensure the long-term protection of these precious resources. In conjunction with the Town of Nantucket and a grant from the NLC and Great Harbor Yacht Club, Charles Costello from the Massachusetts Department of Environmental Protection conducted a detailed eelgrass survey of Nantucket. His results highlight the stark decline of eelgrass in the past few decades. Click here to read his report: 2015 Nantucket Eelgrass Mapping(PDF). In the early 1980’s the NLC entered into a partnership with the United States Geologic Survey (USGS) to assist with groundwater level monitoring across the island. The USGS monitors groundwater resources across the country. Once every month NLC staff takes measurements at 10 island wells from Madaket to Siasconset. These measurements show the seasonal and annual fluctuations in groundwater levels, but also provide a valuable data set of how the upper level of the aquifer, the island’s single source of fresh water, has changed over time. In 2014 the NLC began sampling a subset of the island’s smaller ponds for which there is very little, if any, historic data. While the great ponds are well monitored by the Town of Nantucket, many of the smaller ponds and watersheds have not been studied. The ponds below have been sampled on a rotating basis, and the NLC hopes to add to this list in the future. Please click on the links below for results, to date, of this research. In 2015 the Nantucket Land Council partnered with the Nantucket Pond Coalition and the Town of Nantucket in a new study funded by the state and federal government through the Clean Water Act. This study is being conducted on both Hummock Pond and Miacomet Pond throughout 2016. It will determine whether elevated levels of Phosphorus are entering the pond via groundwater and stormwater from the surrounding watershed and/or if it is being internally recycled from sediments already in the pond. A list of all water reports and other Nantucket Land Council publications can be found here.